The National Highway Traffic Safety Administration (NHTSA) defines a fatal crash as alcohol-related if either a driver or a non-motorist had a measurable or estimated blood alcohol concentration (BAC) of 0.01 or above. Alcohol-related traffic fatalities, better known as drunken driving fatalities, were the key factor behind the National Minimum Drinking Age Act of 1984. 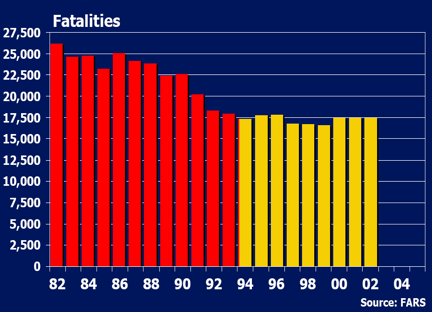 As the graph shows alcohol-related traffic fatalities have decreased over the years. Advocates of the 21 year-old drinking age have long argued that the decrease in fatalities was a result of the higher drinking age but cannot offer a cause and effect relationship. There is little disputing that this statistical decline represents the cumulative effect of a great many changes not limited to the 21 year-old drinking age. Motor vehicles are in general much safer now than they were in 1982, when, for example, air bags were rare and crash-worthiness was an unknown term. Drivers are in general better protected, owing not only to these safety features but also to mandatory seatbelt laws. Law enforcement is much more vigorous now than in 1982, with advances in radar and breathalyzer technology, airbag and anti-lock brake requirement, the increased use of sobriety checkpoints, advent of zero tolerance laws in all 50 states, growth in use of ignition interlock devices, and a lower minimum BAC. Finally, the “designated driver,” a term virtually unknown in 1982, has now become commonplace. Indeed, research showing a 25% reduction in the tendency to drink and drive would seem to suggest designated driving is the norm and not the exception.